(2004) SITAR Newsletter, 4(3), 2, 5. See also the more up-to-date version: The Generalized Interpersonal Theory. In recent years, a consensus has been building on the structure of personality traits. It appears that five broad dimensions are necessary to describe personality across many cultures (e.g., Saucier & Goldberg, 2001). In addition, recent studies have converged on a common structure of psychological disorders. It appears that two broad dimensions, internalization (feeling bad) and externalization (making others feel bad), are necessary to describe psychopathology in many large-scale epidemiological and treatment-seeking samples in multiple cultures (e.g., Acton, Kunz, Wilson, & Hall, in press; Krueger, 1999; Krueger, Caspi, Moffitt, & Silva, 1998; Krueger, Chentsova-Dutton, Markon, Goldberg, & Ormel, 2003; Krueger et al., 2002; Krueger & Finger, 2001; Vollebergh et al., 2001). In order to provide a framework for understanding these robust findings, the Generalized Interpersonal Theory (GIPT) draws upon several theoretical traditions. Chief among these is the interpersonal theory of personality (e.g., Acton & Revelle, 2002, 2004; Carson, 1969; Leary, 1957; Kiesler, 1983; Wiggins, 1979). The GIPT expands and reformulates key elements of "classical" interpersonal theory while preserving other important elements. For example, the GIPT expands the definition of what is considered interpersonal. Formerly, only the traits of extraversion and agreeableness were included in the interpersonal circle (McCrae & Costa, 1989). 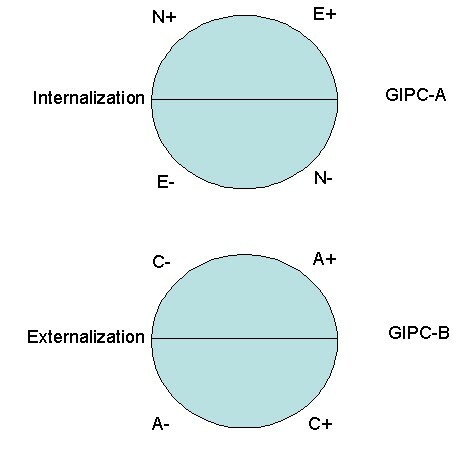 The GIPT includes a structural model with an extraversion-neuroticism circle that deals with affective dispositions (the Generalized Interpersonal Circumplex of Affect, GIPC-A) and an agreeableness-conscientiousness circle that deals with behavioral dispositions (the Generalized Interpersonal Circumplex of Behavior, GIPC-B) (Figure 1). The theory also includes a dynamic model that predicts affect and behavior in interpersonal interactions based on predisposing personality traits. Because intellect or openness is more cognitive in nature and does not appear to have direct affective consequences (Yik & Russell, 2001), because it is the least consistently found cross-culturally of the Big Five (Saucier & Goldberg, 2001), and because it appears to have limited relevance to psychopathology (Widiger, 1993), it is not included in the structural or dynamic model. The GIPT proposes that common mental disorders can be conceptualized as extreme manifestations of normal personality dimensions (e.g., Acton, 1998; Acton & Zodda, in press). Due to the influence of the Diagnostic and Statistical Manual of Mental Disorders, psychological disorders are usually conceptualized as categories. Nevertheless, dimensional models of personality disorders have increasingly inspired considerable enthusiasm among psychopathology researchers (e.g., Widiger, 1993). Only recently, however, have dimensional models of syndromal (Axis I) disorders such as major depression and drug dependence been proposed and tested empirically. Using confirmatory factor analysis and item response theory, Krueger and colleagues have shown that unipolar mood and anxiety disorders form a common dimension of internalization and that antisocial behavior, substance use disorders, and impulsivity/disinhibition form a common dimension of externalization (e.g., Acton, 2003; Acton et al., in press; Krueger, 1999; Krueger et al., 1998; Krueger et al., 2002; Krueger et al., 2003; Krueger & Finger, 2001; Vollebergh et al., 2001). Research on internalizing and externalizing disorders is important (a) because it shows what the most important dimensions of psychopathology might be, and (b) because it is consistent across many diverse large-scale data sets. What it does not show, however, is that these disorders are in fact dimensional--because factor analysis and item response theory will always find dimensions, and thus it is trivially true that internalization and externalization are descriptive dimensions. To examine the next step in this research program requires a conceptual and psychometric framework in which both dimension-likeness and category-likeness are possible and can be tested empirically. The dimension/category framework (Dimcat) (De Boeck, Wilson, & Acton, 2005) is such a framework. Dimcat specifies a method by which manifest categories, such as a diagnosis of major depression versus its complement (another diagnosis or the absence of a diagnosis), can be shown to be dimensional or categorical with respect to an underlying descriptive dimension, such as internalization. The strongest aspect of classical interpersonal theory is its specification of patterns of dyadic interactions. An unpublished meta-analysis indicated that state-level specifications of dyadic interactions as sequences of behaviors had large effect sizes, much more so than trait-level specifications of dyadic interactions as global or summative ratings. According to the interpersonal principle of complementarity (e.g., Carson, 1969; Kiesler, 1983) when understood in relation to the five-factor model (McCrae & Costa, 1989), agreeable behaviors probabilistically cause extraverted behaviors in others, and vice versa, whereas disagreeable behaviors probabilistically cause introverted behaviors in others, and vice versa. In the dynamic model of the GIPT, the classical interpersonal principle of complementarity is preserved, expanded, and reformulated. According to the dynamic model, extraversion in the self and agreeableness in a partner increase the probability that one will experience a pleasantly aroused emotional state that Watson, Wiese, Vaidya, and Tellegen (1999) called positive activation (PA), whereas neuroticism in the self and non-conscientiousness in a partner increase the probability that one will experience an unpleasantly aroused emotional state that Watson et al. called negative activation (NA). Conversely, agreeableness in the self and extraversion in a partner increase the probability that one will exhibit positive behavior (PB), whereas non-conscientiousness in the self and neuroticism in a partner increase the probability that one will exhibit negative behavior (NB). This Generalized Interpersonal Principle of Complementarity incorporates the older correspondence between agreeableness and extraversion, expands the correspondence to include non-conscientiousness and neuroticism, and reformulates the correspondence to be between (state-level) behavior and affect, which have a (trait-level) basis in personality traits. In Figure 1, complementary traits are located at similar positions on each circle. For example, the complement of low conscientiousness is high neuroticism--that is, non-conscientious behavior (e.g., not completing one's duties in a timely manner) causes others to feel distress. In contrast to complementarity, anticomplementarity, or the antidote, can be defined as the opposite of the complement. An anticomplementary response is the treatment for an unwanted trait. For example, high conscientiousness is the antidote for high neuroticism. To help reduce the expression of the unwanted trait of high neuroticism, people in the social environment--friends, family, even strangers--would need to act in a highly conscientious manner, being very careful of their words and actions, walking on eggshells, so to speak. The dynamic model provides a framework for understanding several common interpersonal aspects of psychopathology. For example, depression (an internalizing disorder) tends to elicit rejection (externalizing behavior) (Coyne, 1976), and expressed emotion (criticalness, hostility, or emotional overinvolvement--all externalizing behaviors) in family or friends is associated with relapse in depression (an internalizing disorder) (Butzlaff & Hooley, 1998). These lines of research are consistent with the contention that internalization is the complement of externalization. Overall, the Generalized Interpersonal Theory generalizes classical interpersonal theory by including two additional traits from the Big Five personality dimensions, and it provides a method for testing whether common mental disorders are only extreme manifestations of these personality dimensions. It also provides a framework for predicting affect and behavior in interpersonal interactions based on the same predisposing personality dimensions. Acton, G. S. (1998). Classification of psychopathology: The nature of language. The Journal of Mind and Behavior, 19, 243-256. Acton, G. S. (2003). Measurement of impulsivity in a hierarchical model of personality traits: Implications for substance use. Substance Use & Misuse, 38, 67-83. Acton, G. S., Kunz, J. D., Wilson, M., & Hall, S. M. (in press). The construct of internalization: Conceptualization, measurement, and prediction of smoking treatment outcome. Psychological Medicine. Acton, G. S., & Revelle, W. (2002). Interpersonal personality measures show circumplex structure based on new psychometric criteria. Journal of Personality Assessment, 79, 456-481. Acton, G. S., & Zodda, J. J. (in press). Classification of psychopathology: Goals and methods in an empirical approach. Theory & Psychology. Butzlaff, R. L., & Hooley, J. M. (1998). Expressed emotion and psychiatric relapse: A meta-analysis. Archives of General Psychiatry, 55, 547-552. Coyne, J. C. (1976). Depression and the response of others. Journal of Abnormal Psychology, 85, 186-193. Krueger, R. F. (1999). The structure of common mental disorders. Archives of General Psychiatry, 56, 921-926. Krueger, R. F., Caspi, A., Moffitt, T. E., & Silva, P. E. (1998). The structure and stability of common mental disorders (DSM-III-R): A longitudinal-epidemiological study. Journal of Abnormal Psychology, 107, 216-227. Krueger, R. F., Chentsova-Dutton, Y. E., Markon, K. E., Goldberg, D., & Ormel, J. (2003). A cross-cultural study of the structure of comorbidity among common psychopathological syndromes in the general health care setting. Journal of Abnormal Psychology, 112, 437-447. Krueger, R. F., & Finger, M. S. (2001). Using item response theory to understand comorbidity among anxiety and unipolar mood disorders. Psychological Assessment, 13, 140-151. Krueger, R. F., Hicks, B. M., Patrick, C. J., Carlson, S. R., Iacono, W. G., & McGue, M. (2002). Etiologic connections among substance dependence, antisocial behavior, and personality: Modeling the externalizing spectrum. Journal of Abnormal Psychology, 111, 411-424. McCrae, R. R., & Costa, P. T., Jr. (1989). The structure of interpersonal traits: Wiggins's circumplex and the five-factor model. Journal of Personality and Social Psychology, 56, 586-595. Saucier, G., & Goldberg, L. R. (2001). Lexical studies of indigenous personality factors: Premises, products, and prospects. Journal of Personality, 69, 847-880. Vollebergh, W. A. M., Iedema, J., Bijl, R. V., de Graaf, R., Smit, F., & Ormel, J. (2001). The structure and stability of common mental disorders: The NEMESIS study. Archives of General Psychiatry, 58, 597-603. Watson, D., Wiese, D., Vaidya, J., & Tellegen, A. (1999). The two general activation systems of affect: Structural findings, evolutionary considerations, and psychobiological evidence. Journal of Personality and Social Psychology, 76, 820-838. Widiger, T. A. (1993). The DSM-III-R categorical personality disorder diagnoses: A critique and an alternative. Psychological Inquiry, 4, 75-90. Wiggins, J. S. (1979). A psychological taxonomy of trait-descriptive terms: The interpersonal domain. Journal of Personality and Social Psychology, 37, 395-412. Yik, M. S. M., & Russell, J. A. (2001). Predicting the Big Two of affect from the Big Five of personality. Journal of Research in Personality, 35, 247-277.